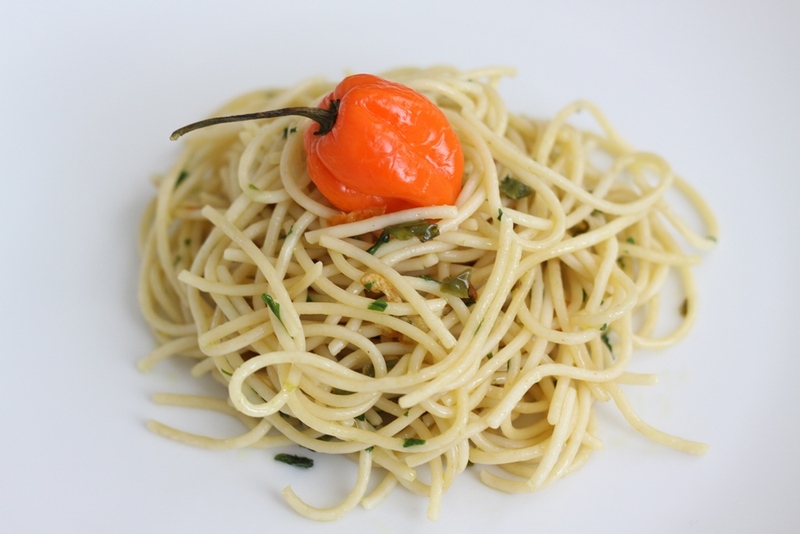 The Italian name for this simple, flavorful and powerful dish is Spaghetti Aglio, Olio e Peperoncino. We got it from an Italian cookbook – Il cucchiaio d’argento, or The Silver Spoon, which has basically been the main cookbook in Italy since the 1950s. It is the cookbook that can be found practically in every kitchen in Italy, brides receive it as a wedding gift, parents pass it on to their kids. It was first translated into English in 2005 and I have to admit that the recipes in this book are simple, delicious, have a nice ring to the names and can provide plenty of options for the ingredients that are already in your fridge. Heat the oil in a small pan, add the garlic and chile and cook over low heat for a few minutes until the garlic is golden brown. 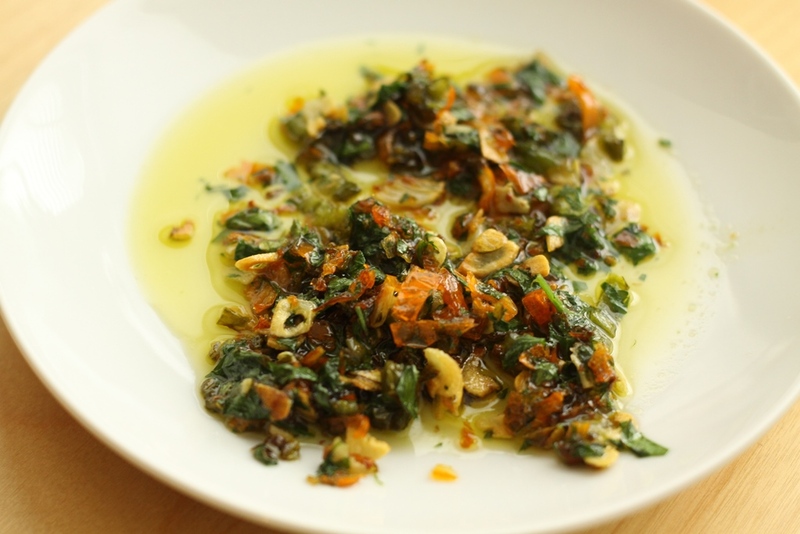 Season lightly with salt, remove the pan from the heat and add the parsley. Go easy on chile pepper and garlic. I used a whole long hot pepper and a habanero pepper, 5 cloves of garlic, about 7 tablespoons of olive oil … and loved it, but it was so spicy that my wife couldn’t eat it. “Even the air is spicy here”, she said walking into the kitchen. On my part though, considering single digit or often negative temperatures lately, the most snow Columbus has ever seen, and that stupid rat of Groundhog Phil who promised us this nightmare to go on forever – considering all this, every little bit of warming substance counts. That, of course, extends to massive amounts of alcohol that we absolutely must consume! On a serious note, wherever you are in the US, chances are you feel the same way about this winter. Try this recipe and let me know how you fared with it. Stay warm, healthy and safe. And have some confidence – spring is coming (eventually)! This entry was posted in European, Italian, Pasta. Bookmark the permalink.